You’d think that Andrew Adonis, the former Secretary of State for Transport who introduced HS2, would have a better idea than most about the realities of daily travel in the regions. It turns out, he doesn’t. In a tweet on Friday, it seems he encountered a train unfamiliar to him: the Pacer. I think you know the answer to your own question. Your were after all Minister for Transport in the last Labour Government so presumably knew how bad they were even 10 years ago ! 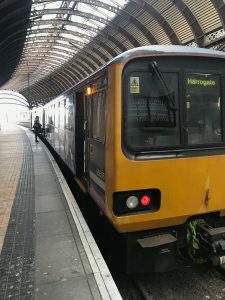 It’s a Pacer Andrew, they existed when *YOU* were Secetary of State for Transport – they were 20 years old and knackered then, now they’re 30 years old and knackered – are you really only just seeing them or are you playing up to the crowd now you have lots of twitter followers? Have you only now discovered the joy of the Pacer? We have been banging on about them for years. Weren’t you Minister for Transport and on the Infrastructure Commission? @MichaelSadgrove for info. Don’t get up north very often? I’m so glad that 13yrs of a Labour government solved the north’s transport issues and gave us a rail system fit for the 21st century. Altogether now… Things can only get better…..
Tough. As long as you champion the white elephant of #HS2 you have no one else to blame. Overall cost of £58,000,000,000 and rising? If only your 3rd Child #HS2 wasn’t such a spoilt brat and didn’t use up all the pocket money. Rich coming from you. If you hadn’t helped facilitate HS2 we’d have more than enough to spend on existing trains and track.